Harden’s scoring so much, defenders are pulling out anything they can think of to try and stop him. James Harden scores at such a ridiculous rate that you can’t trust him anywhere on the court — even if he’s on the floor, 30 feet away from an already advanced ball on the wrong side of halfcourt. Brewer and Harden are former teammates, but clearly The Beard didn’t appreciate the extra-ness of the, uh, aggressive defense. 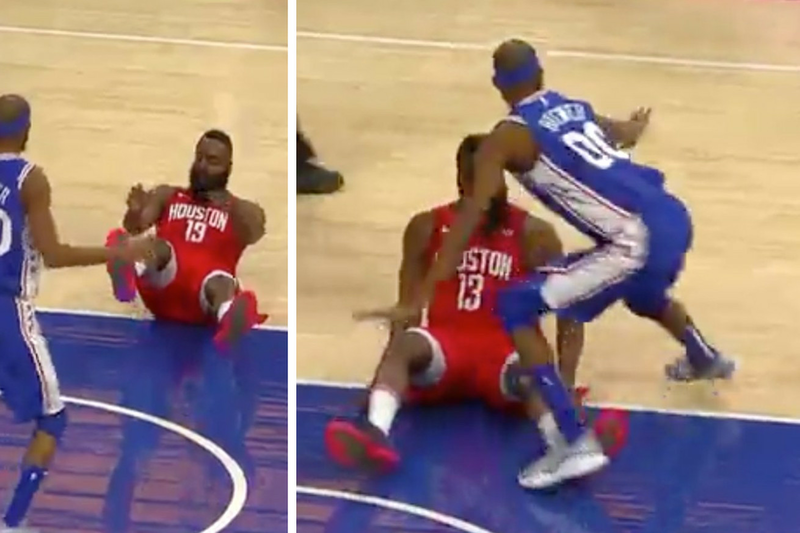 Harden shoved him away in disgust after being face-guarded from the ground. That wasn’t it from Brewer, either. After a breakaway dunk, he nudged into Harden, playing way-too-close defense that coerced the refs to call a foul on Harden instead. This isn’t the only weird defense played against Harden in this month alone. Josh Hart, the Lakers wing, defended the Rockets star by placing his hands behind his back for the duration of entire plays. None of these defensive tactics appear to work, though. James Harden is unstoppable.